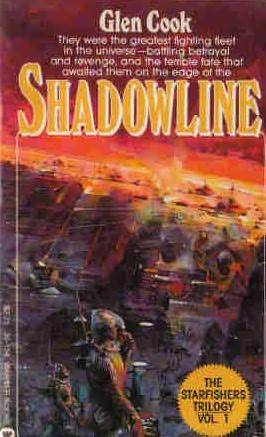 Shadowline | What a book! I first bought Glen Cook’s “Shadowline” back in high school in the ‘80s at my local bookstore and it sat on my bookshelves from Vermont to Boston to four cities in Indiana. Back then I was buying (and reading) a book every few days during downtime in class, during slow shifts at work, at night, on weekends, on trips and I bought book after book after book. So of course, not everything I bought was necessarily good, but if I thought a book looked cool, then I bought it. Such was half the case with “Shadowline,” book one of a trilogy (of course) called The Starfishers Trilogy. Half the case as in it looked cool. Flashforward 25 years or so. I finally picked it up to read after seeing this interesting post about the failings of most “military science fiction.” The post mentions “Shadowline” a being one of the better examples of a writer showing how combat might realistically evolve into the time period of the story instead of being stuck on World War II tactics. So I immediately headed downstairs to the giant bookshelf and grabbed this, as, I found after a brief Twitter exchange with the author of the post, the Starfishers Trilogy is being distributed again (which is good, because I only just recently found only a copy of Vol. 3 at Von’s at Purdue despite looking for them all these years). Wow, what a great book and one I wish I’d read before. Interesting characters, almost none of whom you’ll really like, but you won’t really dislike. They are products of their time and environment and station in life. In fact, it’s amazing that some of them have even succeeded in their lives at all. The main action of the plot takes place in 3031, with flashbacks, and an occasional flashforward, to different points in the main characters’ lives, slowly filling out the developments in the main story. After a series of wars between humans and human-like alien races, corporations and private mercenary armies pretty much run the galaxy, with a distant federated government keeping a distance, only getting involved, and devastatingly so, when it can no longer ignore a problem or conflict. The focal planet is Blackworld, a planet where one side is in permanent darkness (which is the habitable side) and blazing deadly starlight (which is where a lot of the valuable minerals are). Mining interests jockey back and forth for profitable dominance of Blackworld. Into the mix comes the Storm family and all its dysfunctional, harsh, violent, cold members. It’s their saga the book mostly follows, as well as an alien, named Deeth, who has for some reason sworn vengeance on humans, the Storms in particular. Occasionally in this story we see the Starfishers, who just seem to be these mysterious badasses that everybody fears, although we’re not shown why. That is one of the particular shortcomings of this book: There is a lot of backstory that you want to know that you aren’t shown. I’m sure more will be revealed in subsequent books, but there is much I fear may not be, although I could be wrong. Cook mixes actual Earth historical and cultural references — planets have names like The Big Rock Candy Mountain, and fictional future wars are named right alongside actual historical Earth conflicts – that hint at a richer story than is included here. Still and all, this is a great book and one that doesn’t deserve to be overlooked in the sci-fi reader’s library for 25 years. If you like: Military science fiction, military fantasy or flawed character stories (a la George R.R. Martin’s Song of Ice and Fire although not nearly as complex), you’ll like this.